Took this photo on the way home from work. 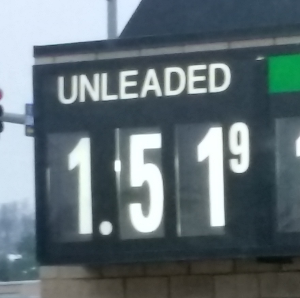 I haven’t seen gas prices this low in over a decade. More on the craziness of the local gas prices… Just before Christmas, (just after I noted a different pattern) the price of a gallon of unleaded dropped slowly from $1.61 to about $1.54, stayed there for a couple of days, and then jumped to $1.69 — and stayed there for a couple of days. I figured that the old pattern had returned, but today, the price went from $1.69 to $1.51! I wish I understood all that. After all, yesterday the news was all full of how the Saudis were getting really tired of running a deficit, and decided to raise the price of oil. The other oil-related story was about the end of the restrictions on US oil exports. Both of those where expect to raise the price of oil, but instead, it dropped. As much as I’m enjoying the cheap gas, I’m a bit worried about the real message behind the current low prices. Last time that happened, it was due to a sharp recession. This time, I’m not hearing much about a recession, but I seriously doubt that the current government would be “transparent” about what is happening in the economy.